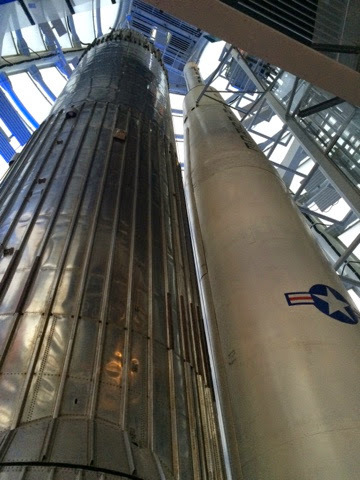 We went to the National a Space Centre last weekend in Leicester, and it was really good! At the cafe till there were some flavoured chocolate bars - branded to match the museum. Naturally I chose the strawberry. You may spot the bottom of a large rocket at the bottom, it's also just let off steam (well - dry ice) covering all the children cowering underneath. Good, scientific fun! The rocket is around 6 floors high, and pretty impressive. The chocolate is about 8 cubes long and very unimpressive. If you close your eyes and really concentrate you can imagine that there is a strawberry flavour. It's not that strong even then. There is a sweetness to the chocolate but then the chocolate itself is not that luxurious anyway. The bar doesn't list the manufacturer and isn't even brightly coloured. It's clear that the packaging has had far more thought and attention than the contents. While a little disappointing (for £2) it's not entirely unexpected. As the money goes into the space centre it's not even that upsetting. 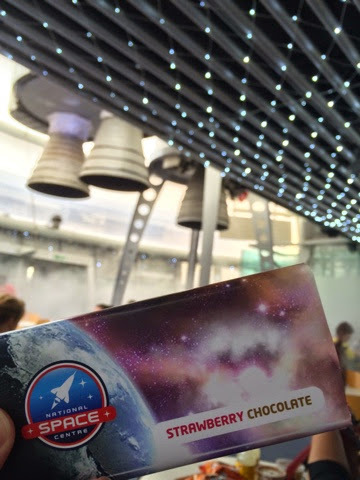 Having a nibble on it as we went round is good, but eating the remaining bits while at work and remembering sitting in the capsules and wandering around bits of space station is worth the additional money. It's certainly no worse than advent calendar chocolate after all! But hey, it's so cool to try this!